The idling speed is controlled by the etcs (electronic throttle control system). The etcs is comprised of: 1) the one valve type throttle body; 2) the throttle actuator, which operates the throttle valve; 3) the throttle position (tp) sensor, which detects the opening angle of the throttle valve; 4) the accelerator pedal position (app) sensor, which detects the accelerator pedal position; and 5) the ecm, which controls the etcs. Based on the target idling speed, the ecm controls the throttle actuator to provide the proper throttle valve opening angle. The learned idling air flow volume remains at the maximum or minimum volume 5 times or more during a drive cycle. After driving at 10 km/h (6.25 Mph) or more, the actual engine idling speed varies from the target idling speed by between 100 rpm and 200 rpm, 5 times or more during a drive cycle. 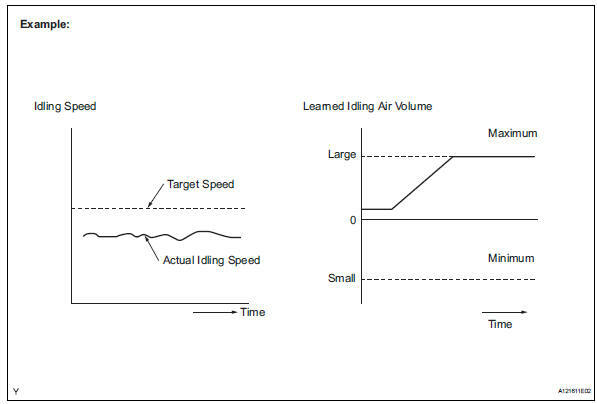 Example: if the actual idling speed varies from the target idling speed by more than 200 rpm* 5 times during a drive cycle, the ecm illuminates the mil and sets the dtc. *: Threshold idling speed varies with engine load. The floor carpet overlapping slightly onto the accelerator pedal, causing the accelerator pedal to be slightly depressed and therefore the throttle valve position to be slightly open. The accelerator pedal being not fully released. Select the following the menu items: diagnosis / enhanced obd ii / dtc info / current codes. If any dtcs other than p0505 are output, troubleshoot those dtcs first. Ok: pcv hose is connected correctly and is not damaged. Check the air induction system for vacuum leakage. Ok: no leakage from air induction system. Check the throttle valve condition. Ok: throttle valve is not contamainated with foreign objects and moves smoothly.